Finally, as she opened her carton of milk, Delilah's grim tangle of thoughts cleared enough for one to shine through. If that girl was a monster, anyone could be a monster. That's why the world was so terrified of another reaping. Because just like last time, humanity would never see it coming. But if monsters could look like humans, and humans could look like monsters, how could anyone ever really be sure that the right people stood on the outside of all those cage? Pennington shrugged. "I'd keep it handy. That once's got a mouth like a snake." Metzger's eyebrows shot up. "She has venomous fangs?" He pulled a small notebook from his jacket pocket. "That should narrow things. down." Pennington shook his head, looking confused. "No, she's a smartass." The oracle's gaze narrowed on the dimly lit figure. The woman's dark hair hung limp and her eyes were dull with exhaustion, but Roomily had seen her trust face. She knew the terror it could inspire. "She won't serve her dish cold," the oracle mumbled, almost giddy with job as chill bumps rose all over her skin. "And two graves wouldn't be near enough . . ."
It's no secret that I enjoyed Rachel Vincent's The Soul Screamer's and when I read the synopsis for Menagerie, I got all the more excited. Menagerie is set in an alternate version of our world where creatures like mermaids, faeries, minotaurs, sirens, so on and so forth, are real and known to all. In 1986 an event known as The Reaping occurred and all non-humans (and non-100%-humans) were stripped of all their rights and considered property. For reference, our heroine, Delilah, comments many times that animals have more rights than hybrids. While visiting Metzger's Menagerie on her twenty-fifth birthday, Delilah becomes enraged when a handler mistreats and young werewolf, revealing that she is not "human" as she and everyone once believed. After a grueling few hours chained up at the sheriff stations, Delilah is bought by Metzger's Menagerie and turned into an attraction herself. She is placed into Gallagher's care after Metzger instructs him to find out what exactly Delilah is and break her, by any means necessary. I absolutely loved Delilah. After having gone to school to become a crypto-vet and learning the only place she'd be able to get a job would be in a menagerie or a place where hybrids are locked up, Delilah quit school and returned home. While in her captivity at Metzger's enagerie, Delilah begins to befriend the other "attractions," learns about how they live / are treated in the Menagerie, and despite the odds stacked against her, plans a way to get free. Having grown up human, Delilah refuses to just lie down and accept her new lot in life. She backtalks to the handlers, refuses to cooperate, and does her best to look out for Genevieve (the young werewolf from her first transformation). While the story is mainly told from Delilah's point of view, I appreciate the fact that every once in a while Rachel would jump into the head of another character. We witnessed the story from Gallagher, Delilah's mom, residents of Franklin County, a few handlers, and a few hybrids as well. I love that not only do we get to connect with Delilah, but these other characters as well. These narratives rounded out the story, allowed us to the horror of captivity from their eyes, and brought them to life. Aside from Delilah and Gallagher, my favorite has to be Eryx, the minotaur. There is definitely something about Eryx that, minotaur or no, makes him seem like the perfect cuddly pillow. Trust me, if you've read Menagerie (or when you do), that statement will make sense! 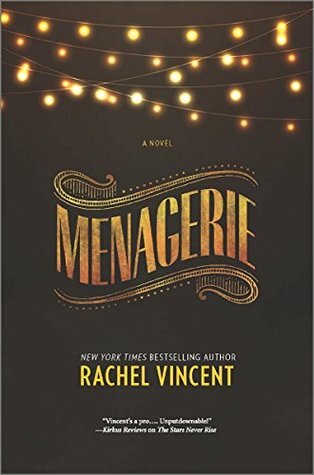 Rachel's writing of Menagerie is absolutely flawless. Her descriptions of the cages, Menagerie itself, the characters, and all their emotions were spot on. I could picture myself walking around Metzger's Menagerie, staring through the bars (both into and out of cages), and understanding the injustice Delilah and her fellow captives felt. Menagerie is dark and honest; it had me flipping pages and blocking out the world around me. I couldn't put it down and, while I found the ending rather satisfying, I anxious to dive back into this world with Masquerade.